The somewhat unorthodox design of the action is well illustrated below. itself more of a shotgun design than the equivalent small-bore rifles of the day. The bolt bar engages in a circular groove machined in the receiver. 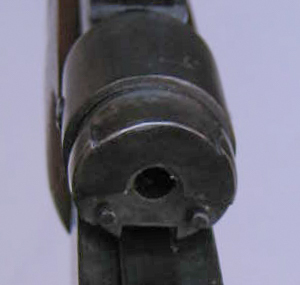 Both the bar and extractor slide forward underneath the barrel's breech. The bolt is forward locking, which is achieved by the internal lugs, within the frontal sleeve of the bolt, engaging with the slots machined circumferentially around the breech face - and visible in the image below. 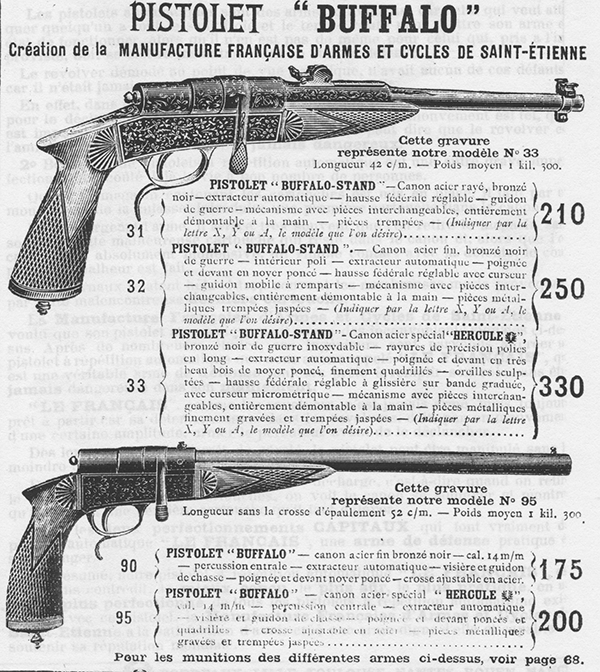 Below is the rifle shown on a page from Manufrance's 1913 catalogue. 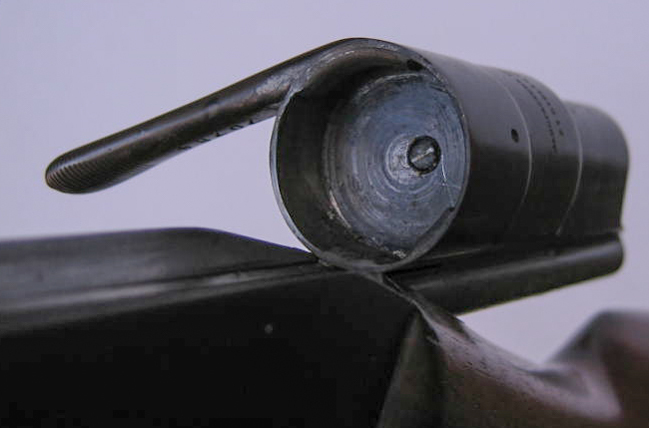 The "Double Culot" (double base) 6mm 'Bosquette' cartridge is illustrated with its conical bullet. 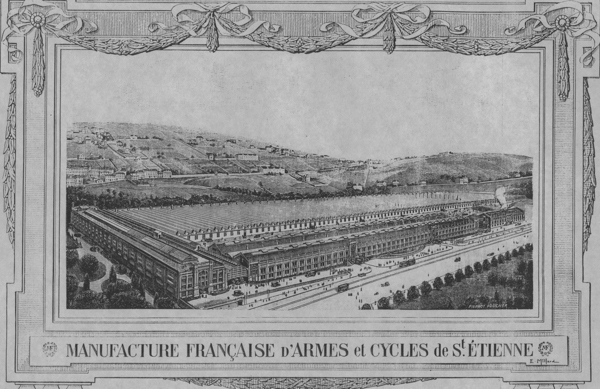 The ammunition was then priced at 15.50 francs per 250 rounds, and the rifle at 275 francs; this when 1 franc was approximately the equivalent of 3.5p. Thus the rifle cost £9.63, and the ammunition about 54 new pence - or around a fifth of a decimal British penny - per round. [Ed: For a retired Brit., it rather goes against the grain to use the obviously plural noun ' pence' to describe a singular new penny!]. 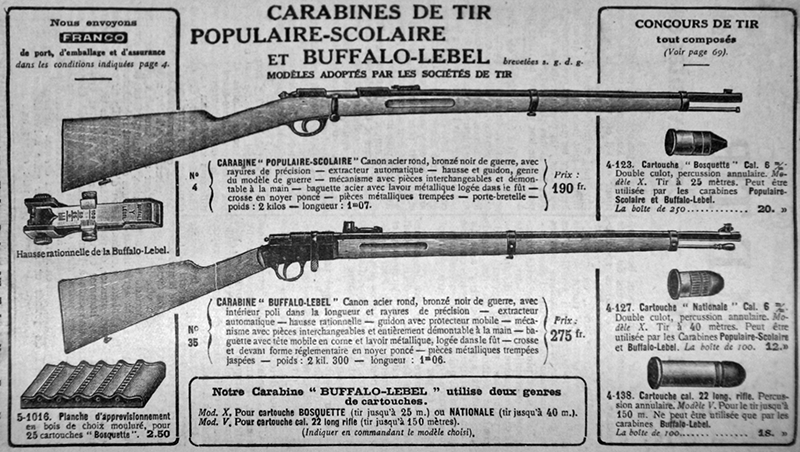 The Buffalo-Lebel was significantly more expensive than the accompanying "Populaire-Scolaire" Carbine indeed by a factor of practically 45%. rearwards under the bolt body as is more commonly seen. which pins firmly locate the extractor. and centralising and locking the frankly rather loosely running bolt and extractor. Below: the action and extractor are viewed from above. The rifle was also earlier advertised, in the 1906 Fry's Compendium, alongside the contemporary Martini Francotte Cadet Rifle. Both rifles were offered for sale by Martin Pulvermann & Co., of The Minories in London, which company was the Sole Agent for Great Britain and Ireland. The Buffalo carbine is noted as complying with the regulations of the Society of Miniature Rifle Clubs. 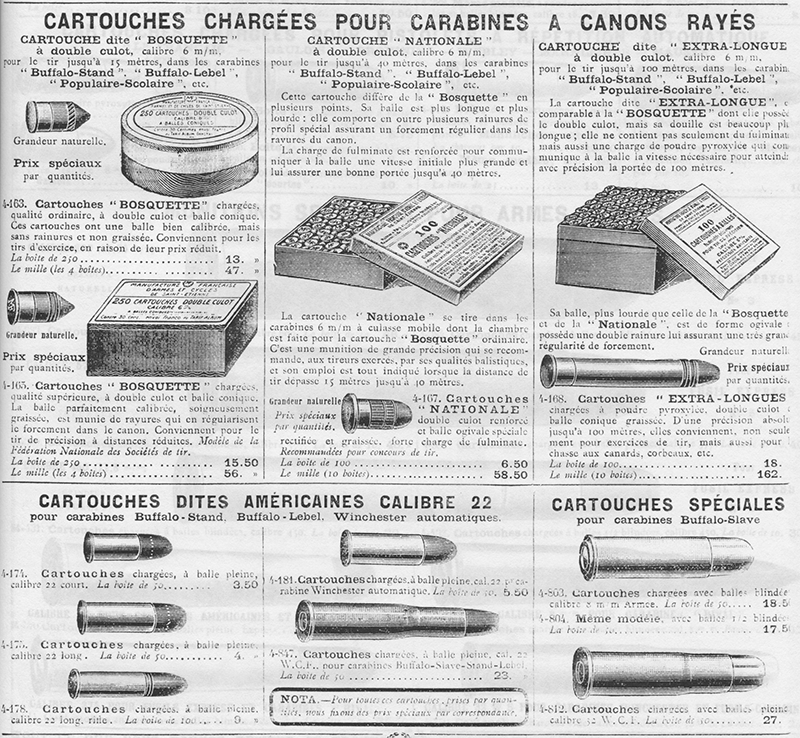 For those whose French language capabilities have deserted them over the years, the cartridges recommended for the "Buffalo-Lebel and Buffalo-Stand" were the 6mm Flobert of the Bosquette system - with conical bullet - intended for ranges up to 25 metres, and the similar 6mm "Nationale" cartridge, also double-based and 'percussion annulaire' (rimfire) - with round-nosed bullet -for ranges up to 40 metres. The Buffalo-Lebel was also available chambered for the .22RF Long-Rifle cartridge, which here has a stated maximum suitable range of 150 mtrs. The rear-sight has a calibrated elevation slide that runs along the elevating ramp on the sight's barrel mount. It is also fitted with a fine windage adjustment slide. 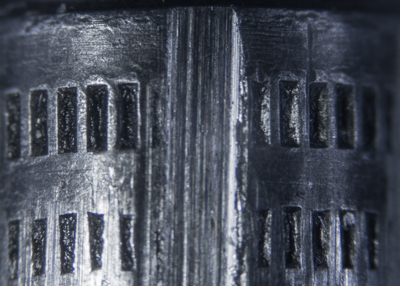 The lubricant indnts are barely touched by the rifling grooves, indicating a comparatively loose fit, as suggested by the measurements given in the earlier data table. As with the Carabine Populaire-Scolaire from the same stable, the Buffalo action was also utilised in a range of pistols. A 1913 advertisement for these is shown below. Prices for these pistols were remarkably close to those for the rifles, and the finely engraved Hercule model was significantly more expensive. 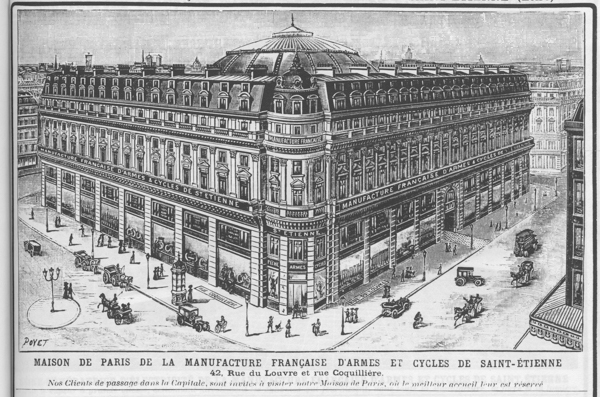 At the date of this catalogue, immediately before the First World War in 1913, the company, that had become "Manufrance" two years earlier, boasted retail outlets in Paris, Marseille, Lyon, Bordeaux, Lille, Toulpuse, Nantes, Rouen and Nancy. By 1973 the outlets number had increased to 64; but, after almost a hundred years of successful operation, bankruptcy was announced in 1980, and liquidation took place in 1985.